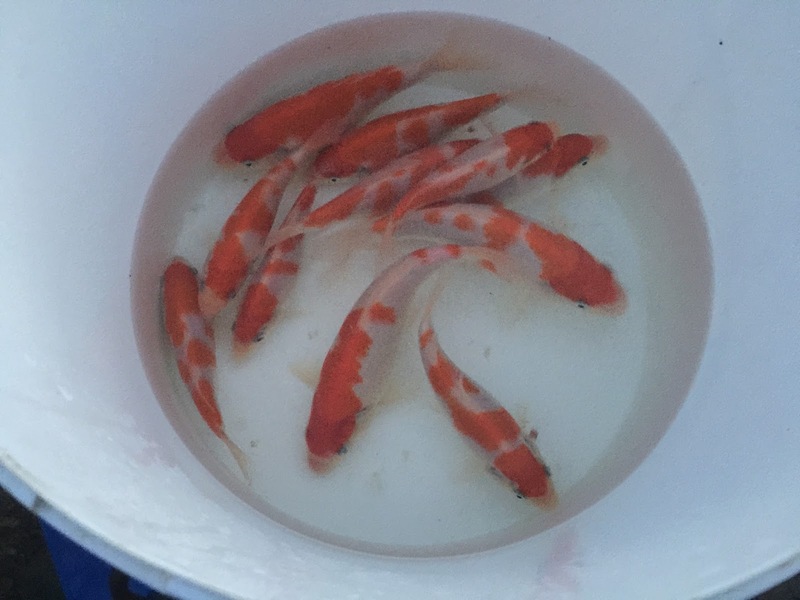 The results are in from this year's Kangei Koi Club Garden Show - this is a closed show for Kangei Koi Club, and is the same format as last year; i.e. the benching team and judge travel to each entrant's pond and bench the koi. the judging happens after the benching weekend, and the results were announced at our December meeting. I achieved some great results, including the Adult champion with one of my Matsue males. The results I am most proud of are from my home bred kohaku, and there were a few awards that left me speechless, namely, winning the Baby champion AND the Young champion with my home bred kohaku's from the 2014 spawnings. And out of those two awards - the one that really stands out is the Young champion. 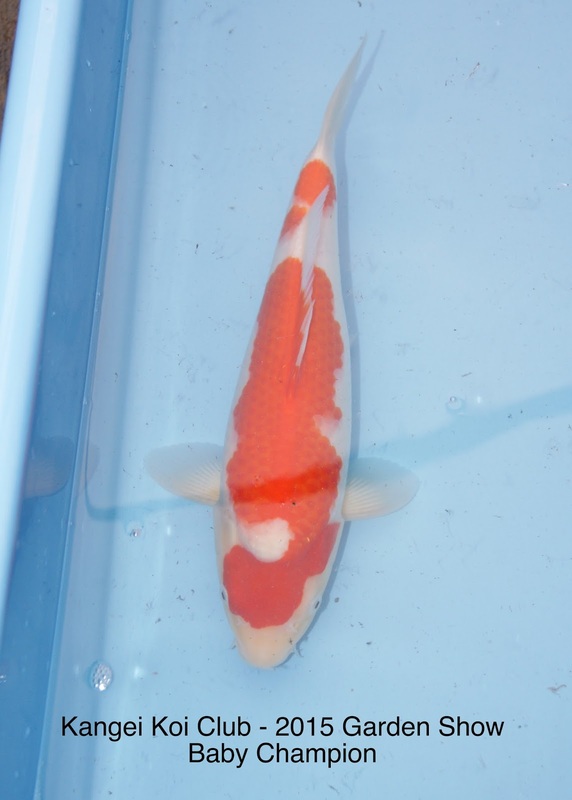 It's a male kohaku from the May 14 spawning; it's the best show result I've had from that spawning and this kohaku beat 67 koi in size 3 and 4 (the 'Young' size category) to win the award. 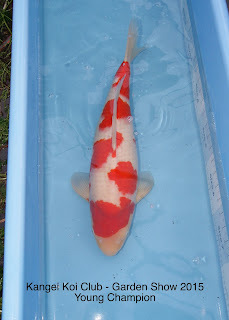 The koi was benched in early September at 49cm, and i remember on the day it was looking particularly good. 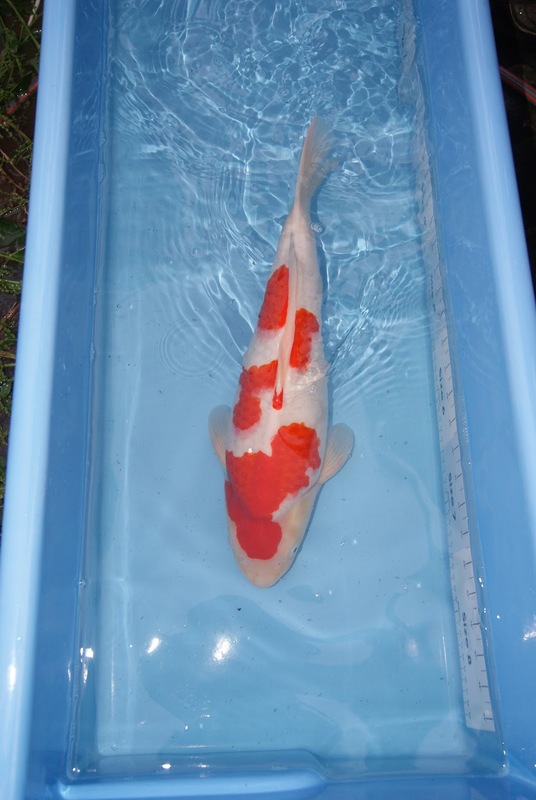 That's part of the risk with showing - the koi are judged on how they look on the day. So many times, koi entered are not at their peak, but this koi was looking the best it had done for at least 6 months on that day, and thank goodness for that! I measured him today at 55.5cm. The Baby champion award was scooped by one of my kohaku's from the July 14 spawning. It's great to be able to look back at this koi as it was a few months ago, when it was benched in September - looking fantastic, and unknown to us, on it's way to winning such a big award. Because, since September, this koi has unfortunately developed a large abdominal bump... which looks ominous. we've got this koi in our growing on tank where it will stay for the winter but to be honest, I don't expect it to last too long. That's koi keeping unfortunately, but what I can take much comfort from is that we were able to show it during it's prime, and it achieved this fantastic award, winning out of 25 koi in sizes 1 and 2 that make up the Baby size group. This is the picture taken during benching in early September when it was 44cm. 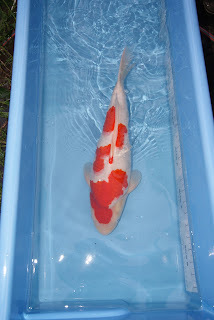 It came second in size 3 overall at the show - ie, size 3 irrespective of variety; out of 30 koi. I measured this koi today, and it's a few mm's short of 50cm. The Kangei Koi Club Garden Show is a closed show, and therefore generally regarded as having less competition than at an open show - but nevertheless, winning overall champion awards at any show is a big achievement and my home bred koi have beaten some pretty decent koi to achieve their placings. Reflecting on the year - that means I have won 1 baby champion award at an open show, and at a closed Garden style show, I've won 1 baby champion and 1 young champion. All three awards with different fish! This is way beyond what I hoped to achieve at this stage and am very grateful for the results. Other news - we were battered with storms a couple of weeks ago, and once again, the petrol generator came in useful . We can have the ponds up and running within 5 minutes of a power outage, and this just helps to keep the fish stress as low as possible in such situations, and restrict the amount of damage to the bacteria in the bio filters - and it's one of the mitigation measures we can put into place as power cuts seem to be a regular occurrence through the winters here. I have one more week at work, then am off for the Christmas / New Year week - and that will give me a chance to go through this year's babies and write up some case studies on my nissai that I've had partially prepared for months. For example, I have pictures of the Young Champion at various stages right back to second selection when it was less than 10cm long.